Shredded Aubergines (290g). Tasty mediterranean aubergines, seasoned with red pepper, garlic and oregano and preserved in olive oil. This is wonderful antipasto which also works well as a side dish or as an ingredient in your pasta recipes. Sundried Tomatoes in Olive Oil (314g). Our tomatoes have been dried in the Mediterranean sun and have an intense, sweet flavour. They are wonderful straight from the jar or alongside some mozzarella as part of a colourful antipasti spread. Sicilian Green Cracked Olives (314g). These slightly spicy, crushed olives have a bold flavour making them ideal as an antipasto or a snack in their own right. Sundried Tomato, Almond and Pistachio Paté (180g). Hand made in Southern Italy from top quality local ingredients, this is a delicious topping for bruschette and crackers. Bomba Calabrese (212g). This super spicy spread is a combination of chopped aubergines, peppers, carrots, celery and green olives mixed with chilli! Grilled Pepper with Oregano and Garlic Antipasto (212ml) These colourful sweet grilled peppers have been flavoured with oregano and garlic and are wonderful served as part of an antipasti platter or on a bruschetta. 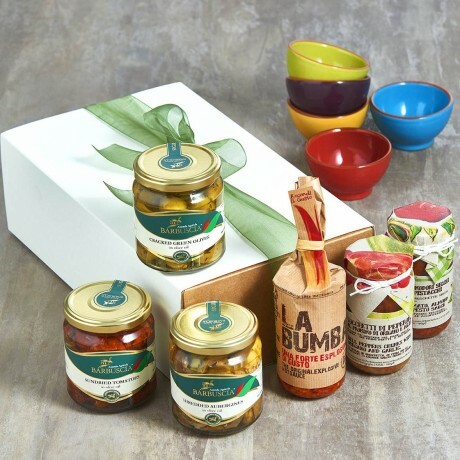 Our antipasti selection is presented in a beautiful box with a lovely big ribbon. A gift message option is available.